What does Christmas mean to me? My answer to this age-old question has evolved over the years from material items to more of a warm, loving sensibility that will live forever in the memories we create. If you think about it, Christmas really is about more than presents, eggnog or cookies; Christmas is about making memories with the people you care about. They don’t have to be limited to family, and you don’t even have to agree all the time. But no matter what you all know that if push came to shove, you’d have each other’s backs. Have you ever thought about the fact that about a third of your life is spent at work? With this in mind, it is even more important to love and appreciate your colleagues. At Cashco Financial, we take that to heart. We’re really just one big family. We live a special kind of culture here at Cashco Financial. We have 5 Core Values that are the guiding force for everything we do. They include Embracing ICAN that encourages everyone to think that “I can be 1% every day”. Owning the Results means that each team member here takes accountability for their priorities. Communicating Honestly shows that everyone at Cashco has a voice that is equally important to everyone else’s. We all Respect the Vision of where Cashco has come from and where we want to go. And finally, we all live the Golden Rule. An example of how Cashco’s 5 Core Values come into play with absolutely everything we do is our team Christmas Pod Decorating Contest. 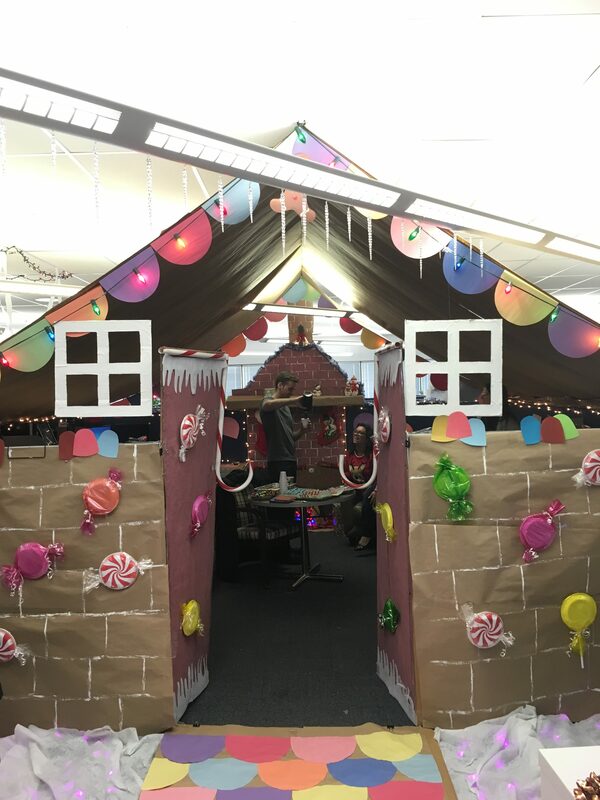 As a member of the Marketing Team, I’ll tell you the story of our gingerbread house. We started with the planning phase where Communicating Honestly almost led to turmoil with each one of us having a different idea of how our pod should be decorated. The animosity was short-lived since we know the importance of Living the Golden Rule. Eventually we agreed on a vision to turn our pod into the world’s best gingerbread house. Over the past two weeks, we all Respected that Vision and Embraced ICAN as we each gathered supplies and stayed late after work to make progress on the construction. Ultimately, we Owned The Results and now get to enjoy our warm and cozy gingerbread house. A Merry Cashco Christmas to you all!